1. 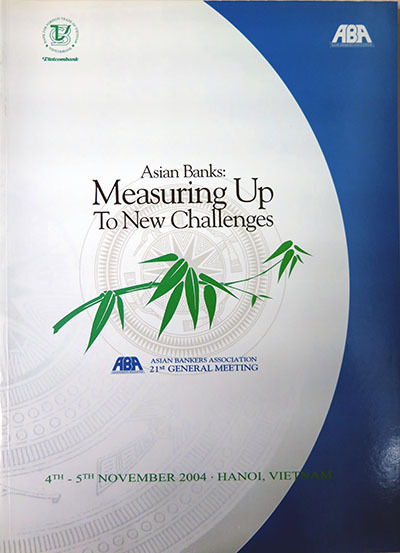 The 21st ABA General Meeting and Seminar was held on 4-5 November 2004 at the Sheraton Hotel in Hanoi, Vietnam. Over 220 high-ranking executives, banking experts, and government officials from 24 countries attended the two-day meeting. 2. Hosted by The Bank for Foreign Trade of Vietnam (Vietcombank), this year’s gathering focused on the theme ”Asian Banks: Measuring Up to New Challenges.” Eminent speakers shared their views on how bankers in the region could effectively address the various challenges arising from the continued globalization of markets. 3. The 34th and 35th Board of Directors’ Meetings were also held in conjunction with this year’s annual meeting. The ABA Board discussed internal policy matters, reviewed the status of the various ongoing ABA projects and programs, elected new officers and members of the Board who would serve for the tern1 2005-2006 and approved the framework for the ABA Work Program for the next two years. 4. Key officers of the ABA led by Ambassador Alfonso T. Yuchengco and Dr. Jeffrey L. S. Koo also had the opportunity to call on Prime Minister Phan Van Khai and on Governor Dr. Le Due Thuy of the State Bank of Vietnam. 5. Representatives from the Tokyo Metropolitan Government and the UFJ Bank Ltd. made a presentation on the Collateralized: Loan Obligation (CLO) and the Collateralized Bond Obligation (CBO) schemes of the Tokyo government as an innovative way of providing financing for SMEs that member banks may adopt in their respective countries. 6. Vietcombank and the Vietnam Banks Association hosted the Welcome Dinner for the delegates. The special guests included Dr. 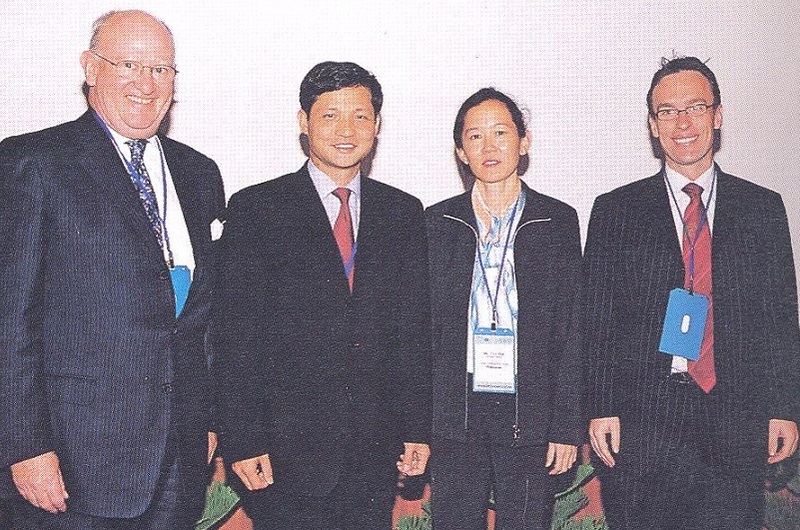 Le Due Thuy, Governor of the State Bank of Vietnam, and Mr.· Le Van So, Chairman of the Vietnam Banks Association. The welcome remarks of Dr. Thuy and Mr. So are attached as Annex 1 and Annex 2, respectively. 7. The Deputy Prime Minister of Vietnam, His Excellency Mr. 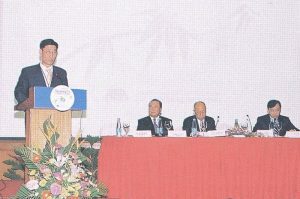 Vu Khoan, in his Keynote Speech said that the State Bank of Vietnam, under the direction of the Government, has been implementing a comprehensive reforn1 program for the commercial banking system, with a view to building a strong and sustainable banking and finance industry based on international standards , capable of competing successfully in the process of global integration. He noted that the reform and restructuring program of the Vietnamese banking sector has started paying initial dividends and is now being continued in more advanced breadth and depth. The full text of Mr. Vu’s Keynote Address is attached as Annex 3. 8. ABA Founder and Chairman Emeritus Dr. Jeffrey L. S. Koo, in his response to the remarks of the Deputy Prime Minister, said that one big challenge that Asian countries are facing today is regional integration. 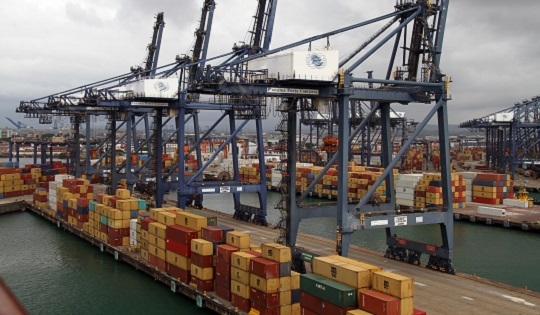 This involves not only the integration of trade but also the creation of regional financial markets that are deep and liquid, strong and stable and based on global best practices. Dr. Koo said the ABA is committed to the strengthening and integration of Asia’s financial markets, and willing to work with the government of Vietnam in this undertaking. The full text of Dr. Koo’s response is attached as Annex 4. 9. ABA Chairman Ambassador Alfonso T. Yuchengco in his Opening Statement said that Asian banks need to sharpen their edge especially in terms of sounder risk management, better corporate governance and comprehensive strategies in response to competition. These measures are needed by the financial sector to meet the challenges brought about by the globalization of markets. Ambassador Yuchengco also called on governments to pursue further reforms to create a more favorable environment for the growth of financial services. The full text · of Ambassador Yuchengco’s Opening Statement is attached as Annex 5. 10. 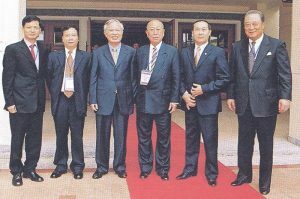 Vietcombank Chief Executive Officer Dr. Vu Viet Noan in his Welcome Remarks said the Bank was privileged to host the Hanoi event, the first time that an annual meeting of the ABA was held in Vietnam. The full text of Dr. Ngoan’s Welcome Remarks is attached as Annex 6. Session One focused on the topic ”Managing Financial Globalization: The Way Forward. Discussions addressed the many new challenges faced by the banking sector arising from the globalization of markets and how Asian banks can sharpen their edge and adopt comprehensive strategies to meet these challenges and remain competitive. 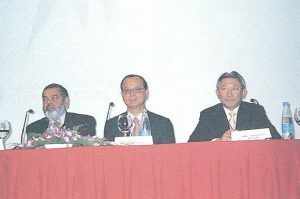 Mr. Dong-Soo Choi, President and CEO of Chohung Bank, served as the session speaker, while Mr. Joseph Jye-Cherng Lyu, Chairman of Bank of Taiwan and Mr. Rajendra Theagarajah, Senior Deputy General Manager of Hatton National Bank, acted as Commentators and Mr. Rizalino S. Navarro, Executive Vice Chairman & CEO, Rizal Commercial Banking Corp. as chairman. Session Two addressed the topic ”Asian Banking: Sizing Up Profit Potential in the New Millennium.” The speaker for this session was Dr. Heh-Song Wang, Adviser to the Minister of Finance, Republic of China, and the commentators were Mr. Joseph T. W. Pang, Executive Director and Deputy Chief Executive of The Bank of East Asia Ltd., and Mr. Stephen Holden, Regional General Manager-Asia, Commonwealth Bank of Australia. The session examined the changing business and financial environment in the region, identified factors affecting the profit potential in Asian banks, and discussed possible strategies that banks can adopt to effectively expand business and maximize profit. Mr. Amitabh Narain, Chief Executive Officer, State Bank of India, Hong Kong Branch served as Chairman for the session. Session Three focused on the topic ”Corporate Restructuring and Equitization.” Featured as speaker was Dr. Vicente Valdepeñas, Member of the Monetary Board of the Philippine Central Bank and former Executive Director of the South East Asian Central Banks (SEACEN). The commentators included Mr. Phillip Crotty, Vice Chairman, Global Corporate Finance, Asia Pacific for Deutsche Bank AG, and Mr. Noel Kullavanijaya, Managing Director, Head of Asia-Pacific Financial Institutions Group, CitiGroup. This session sought to provide a deeper understanding of the driving forces, the challenges and the elements of successful corporate restructuring within an Asian context. Dr. Vu Viet Ngoan, Chief Executive Officer of The Bank for Foreign Trade of Vietnam, served as chairman of the session. Session Four addressed the topic ”Reform and Development of Insolvency Law in the Region.” The speakers for the session were Mr. Richard Fisher, Chairman of Partners, Blake Dawson Waldron (Sydney), and Mr. Michael Sloan, Senior Association, Blake Dawson Waldron (Sydney). The session looked at insolvency law and protection of creditor rights – two issues that are of important concern among banks in the region. The speakers discussed the work they have done with regard to the promotion of regional cooperation in the development of insolvency law reforms. Ms. Clare Wee, Senior Counsel and Deputy Head, Private Sector Legal Unit, Office of the General Counsel, Asian Development Bank, acted as session chairperson. 12. Mr. Shinichi Yoshikuni, Chief Representative, Representative Office for Asia and the Pacific of the Bank for International Settlements, spoke on recent developments with regard to the Basel 2 Accord during the seminar lunch break. He briefed the delegates on how the new risk-based international accord has been shaping up since last year and what its implications are for their businesses and the approaches they should adopt to the measurement of their credit and operational risks, among others. Admitted six new members, including UFJ Bank Ltd. from Japan, Korea Exchange Bank from Korea, Laxmi Bank from Nepal, EnTie Commercial Bank from Taiwan, and Anod Bank and Zoos Bank from Mongolia. approved the ABA position paper entitled “Promoting Effective Region­ Wide Insolvency and Creditor Rights Systems.” In the paper, the ABA urged Asian governments to improve insolvency laws and judicial systems in the region, calling on APEC Finance Ministers to help develop a regional arrangement for cross-border recognition of insolvency administrations. The Chairman’s Report, which summarized the activities undertaken by the ABA over the past year in the area of policy advocacy, training programs for members, membership drive, relationship with other regional bankers groups, and participation in other regional events. The full text of the Chairman’s Report is attached as Annex 7. The amendment of the ABA Charter, removing the provision that made it automatic for the Vice Chairman to assume the position of the Chairman upon the expiration of the term of the latter. Singapore – DBS Bank, Ltd.
Sri Lanka – Hatton National Bank Ltd.
Elected Mr. Dong-Soo Choi, President and CEO of Chohung Bank from Korea, as ABA Chairman for 2004-2006 (replacing Ambassador Alfonso T. Yuchengco, Chairman of the Rizal Commercial Banking Corp.) and Mr. Joseph J.C. Lyu, Chairman of The Bank Taiwan, as Vice Chairman. Approved the proposed Budget for 2005. Adopted the framework for the 2005-2006 Work Program outlining ABA activities over the next two years in the area of policy advocacy, information exchange, capacity building, relationship with other regional and international organizations, and membership expansion. 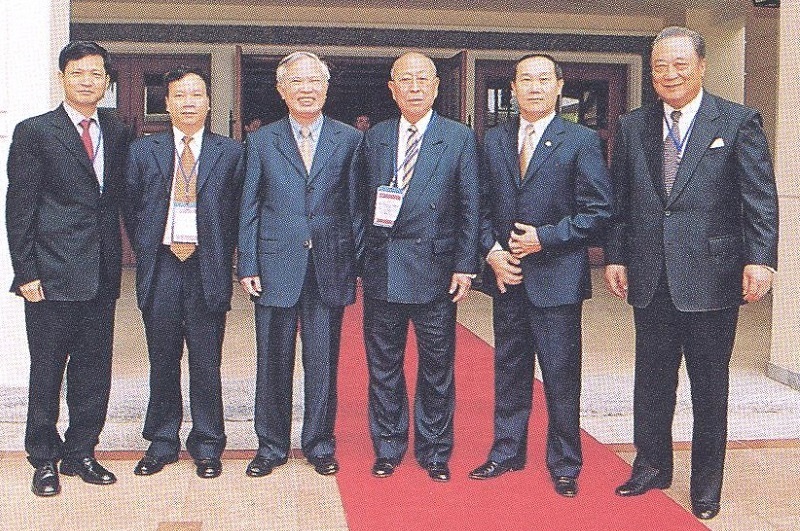 *Asia-Pacific Bankers Congress 2005 scheduled on 28-29 April 2005 in Jakarta. Passed a resolution to present a distinguished service plaque to outgoing Chairman Ambassador Yuchengco for his outstanding service to the Association during his incumbency. Passed a resolution of thanks for the Bank for Foreign Trade of Vietnam for the excellent arrangements made for the meeting and for its warm hospitality to the delegates. 16. 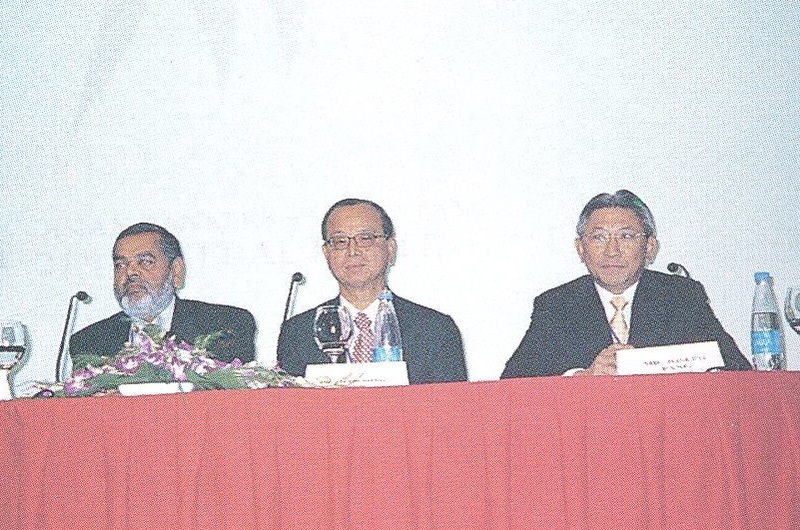 Mr. Dong-Soo Choi in an official turnover ceremony was installed as the new Chairman of the ABA for the term 2004-2005, replacing Ambassador Alfonso T. Yuchengco who served for the term 2002-2004. The full text of Mr. Choi’s Acceptance Speech is attached as Annex 8. Ambassador Yuchengco’s Valedictory Speech is attached as Annex 9. 17. 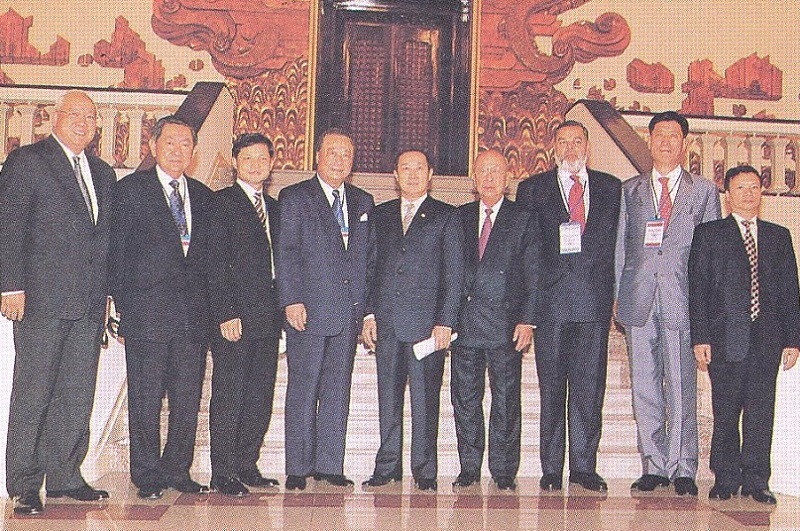 ABA officers led by newly-installed Chairman Mr. Dong-Soo Choi, along with Chief Executive Officer Dr. Vu Viet Ngoan of Vietcombank, joined the panel that responded to the questions fielded by the media people during the Press Conference held at the end of the meeting and seminar. A total of 47 press people – both local and foreign – attended the Press Conference. A copy of the Press Release issued by the ABA and distributed to the press people is attached as Annex 10.